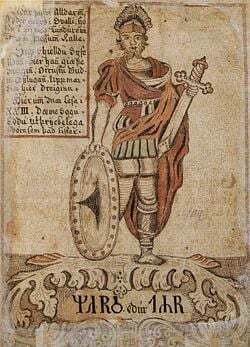 Tyr (Old Norse: Týr) is the god of single combat and heroic glory in Norse mythology, portrayed as a one-handed man. In the late Icelandic Eddas, he is described, alternately, as the son of Odin (in the Prose Edda) or of the giant Hymir (in the Poetic Edda), while the origins of his name suggest that he was once considered the father of the gods and head of the Norse pantheon. As mentioned above, Tyr is a Norse deity, a designation that signifies his membership in a complex religious, mythological and cosmological belief system shared by the Scandinavian and Germanic peoples. This mythological tradition, of which the Scandinavian (and particularly Icelandic) sub-groups are best preserved, developed in the period from the first manifestations of religious and material culture in approximately 1000 B.C.E. until the Christianization of the area, a process that occurred primarily from 900-1200 C.E. The tales recorded within this mythological corpus tend to exemplify a unified cultural focus on physical prowess and military might. Within this framework, Norse cosmology postulates three separate "clans" of deities: the Aesir, the Vanir, and the Jotun. The distinction between Aesir and Vanir is relative, for the two are said to have made peace, exchanged hostages, intermarried and reigned together after a prolonged war. In fact, the greatest divergence between the two groups is in their respective areas of influence, with the Aesir representing war and conquest, and the Vanir representing exploration, fertility and wealth. The Jotun, on the other hand, are seen as a generally malefic (though wise) race of giants who represented the primary adversaries of the Aesir and Vanir. Tyr is generally recognized as a "ruler" god among the Aesir, and it is postulated that his role as the head of the pantheon was displaced only gradually by the worship of Odin. In general, too much emphasis has been placed on the warlike aspects of Tyr, and his significance for Germanic law has not been sufficiently recognized. In should be noted that, from the Germanic point of view, there is no contradiction between the concepts "God of War" and "God of Law." War is in fact not only the bloody mingling of combat, but no less a decision obtained between the two combatants and secured by precise rules of law.... So is explained ... how combat between two armies can be replaced by a legal duel, in which the gods grant victory to the party whose right they recognize. This attribution is also supported by evidence from the Roman period, which seems to describe Tyr as Mars Thingsus ("the god of the þing, or judicial assembly"). In his instruction manual for Nordic skalds (lyric poets), Snorri Sturluson (1178-1241 C.E.) describes some possible kennings (poetic allusions) that could be used to describe Tyr, including "One-handed God, and Fosterer of the Wolf, God of Battles, Son of Odin." His hand was lost in the feeding of Fenrir (an important myth that is discussed below). The name Tyr literally means "god," with an etymology that can be traced by to the Proto-Germanic Tîwaz, earlier Teiwaz, after emerging from the conjectured Proto-Indo-European root *deywos ("god"). Due to this linguistic factor, Tyr is thought to have, at one time, been a major deity (and perhaps even the head of the pantheon), despite his limited representation in the extant mythological corpus. The oldest attestation of the god is Gothic Tyz (Vienna cod. 140), though the word "Teiw" found inscribed on the Negau Helm may very well be a direct reference to this particular deity, rather than to gods (in general). If this was the case, the runic inscription on this helmet would be the oldest reference to Tyr, as it predates the Gothic evidence by several centuries. Tîwaz was overtaken in popularity and in authority by both Odin and Thor at some point before the Migration Age (c. 300-700 C.E.). In terms of his relationship to Thor, it is clear that Tyr's linguistic cognates in other Indo-European pantheons were the original possessors of the thunder (i.e. Zeus), though in some cases control of this attribute was ultimately passed on to another god (e.g. Dyaus to Indra). Despite this gradual transfer of authority, it is still the case that Tyr is the one of the few gods whose strength is ever compared to Thor's in Eddaic myth. When considering Tyr, one particular mythic episode stands out from the rest due to the frequency of re-tellings and allusions to it: namely, the loss of his arm to the demonic wolf Fenrir. 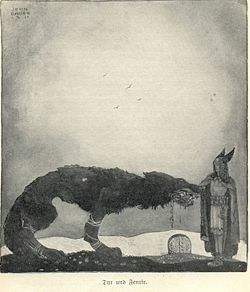 According to the Eddas, Odin was informed through magical means that the three children of Loki (Jormungandr, the world-serpent; Hel, the queen of the Underworld; and Fenrir, the demon wolf) would play a decisive role in the war against the Aesir at Ragnarök (the cataclysmic battle at the end of time). Thus, the high god decided to banish the serpent and the giantess from Asgard, though he, perhaps unwisely, permitted the wolf to stay (likely due to his affinity with lupines). Over time, the gods noticed that the animal was consistently increasing in size, which eventually led them to decide to shackle the beast, in order to keep him from wreaking havoc in their ranks. Unfortunately, the strength of the animal was already so great that he was able to shatter any fetter placed upon him. Eventually, they visited the dwarves (the craftsmen of the gods), who manufactured them a magical ribbon called Gleipnir that looked like a fragile thread but was actually unbreakable. When they attempted to bind Fenrir, however, the animal, sensing deception, refused to submit unless one of the Aesir agreed to place their hand in his mouth (as a security). Tyr, known for his great courage, was the only one who agreed to this compromise—knowing full well what the consequences would be. As the bonds tightened and Fenris realized that he had been tricked, he clamped his mammoth teeth down upon the brave god's flesh. Once the deed was done, "all laughed except Tyr: he lost his hand." In vain do the Scandinavian gods punish sacrilege and perjury, avenge violated peace or scorned law. No one incarnated any more in pure, exemplary fashion those absolute values that a society, even hypocritically, needs to shelter under high patronage.... Even if polytheistic gods cannot be impeccable, they should at least, to fulfill their role, have one of them speak for and respond to man's conscience... Tyr [due to the incompatibility between his false oath and his role as a god of law] can do that no longer." In the end times, Tyr is destined to kill and be killed by Garm, the guard dog of Hel, at least according to the vision of Ragnarök described in the Prose Edda,. Though Tyr/Tiw became relatively unimportant compared to Odin/Woden in the Nordic and Germanic pantheons, traces of his once-high status can still be seen through linguistic evidence. For example, the third day of week throughout the English, Germanic and Nordic world is Tuesday (literally "Tiw's day"), which is named after Tyr (as a god of war) in following the Roman example (whose third day (Martis dies) was dedicated to the Roman god of war and the father-god of Rome, Mars). Likewise, this importance can be seen in the names of some plants, including Old Norse Týsfiola (after the Latin Viola Martis); Týviðr, "Tý's wood"; the Swedish Tibast (the Daphne mezereum); and Týrhialm (Aconitum (one of the most poisonous plants in Europe whose helmet-like shape might suggest a warlike connection)). In Norway, the parish and municipality of Tysnes is named after the god. Additionally, the Swedish forest, Tiveden, may also be named after Tyr, though this may also be due to the definition of tyr as a generic word for "god" (i.e. the forest of the gods). Tyr plainly had much to do with runes and with runic magic. 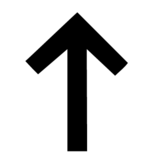 The rune t (↑) is called by his name both in Norwegian and Icelandic runic poems, and the name tir given to in in the Old English Runic Poem, varying with ti in the Salzburg manuscript, must be of the same origin. In the Sigrdrifumál (Words of Sigrdrífa, str. 16), it is said that one who hopes for victory must carve runes on the hilt and other parts of his sword, and he must repeat the name of Tyr three times. ↑ For the origins of his name, and his possible relationship to Tuisto, see Tacitus's Germania. ↑ Lindow, 6-8. Though some scholars have argued against the homogenizing effect of grouping these various traditions together under the rubric of “Norse Mythology,” the profoundly exploratory/nomadic nature of Viking society tends to overrule such objections. As Thomas DuBois cogently argues, “[w]hatever else we may say about the various peoples of the North during the Viking Age, then, we cannot claim that they were isolated from or ignorant of their neighbors…. As religion expresses the concerns and experiences of its human adherents, so it changes continually in response to cultural, economic, and environmental factors. Ideas and ideals passed between communities with frequency and regularity, leading to and interdependent and intercultural region with broad commonalities of religion and worldview.” (27-28). ↑ More specifically, Georges Dumézil, one of the foremost authorities on the Norse tradition and a noted comparitivist, argues quite persuasively that the Aesir/Vanir distinction is a component of a larger triadic division (between ruler gods, warrior gods, and gods of agriculture and commerce) that is echoed among the Indo-European cosmologies (from Vedic India, through Rome and into the Germanic North). Further, he notes that this distinction conforms to patterns of social organization found in all of these societies. See Georges Dumézil's Gods of the Ancient Northmen (especially pgs. xi-xiii, 3-25) for more details. ↑ Jan de Vries, quoted in Dumézil, 44. From this, Dumézil explores his Indo-European thesis and enumerates various parallels between Tyr and the Vedic god Mitra. ↑ Snorri Sturluson, Skáldskaparmál (IX), p. 113 in Brodeur's translation. ↑ Turville-Pietrie, 182; Dumézil, 42-48. See also Orchard, 366 for a brief discussion of this etymology. ↑ This inscription is described in excellent detail in Konstantin Reichardt's "The Inscription on Helmet B of Negau" in the journal Language (Vol. 29, No. 3. (Jul.-Sep. 1953), pp. 306-316). ↑ However, the older god's fortitude is found to be lacking in comparison to his younger (and more popular contemporary), as in the tale of Hymir's kettle (see Lindow, 298-299). ↑ Snorri Sturluson, Gylfaginning (XXXIV), pages 42-45 in Brodeur's translation. See also: Orchard, 365; Lindow, 297-298. Snorri Sturluson. The Prose Edda. Translated and introduction by Arthur Gilchrist Brodeur. New York: American-Scandinavian Foundation, 1916. Tacitus, C. Cornelius. A Treatise on the Situation, Manners, and Inhabitants of Germany and the Life of Agricola. Translated by John Aikin. Warrington: London, 1777. This page was last modified on 24 December 2015, at 16:19.